Play video Gôl Bale... yn fyw ar S4C!Gôl Bale... yn fyw ar S4C! Play video Gôl Bale... yn fyw ar S4C! So the champagne remains on ice, Chris Coleman's side tantalisingly close to Euro 2016. Belgium's failure to defeat Cyprus in Nicosia later will be enough to spark late night celebrations in Wales but it could be next month before they confirm their place in France next summer. The lads were tired at the end of a five hour flight to Cyprus and five hours back. Then playing Israel today, it has taken it out of us. We are four more points closer to where we want to be. We need one more nudge and then we are there." These boys know each other so well because they have played together since their youth. John Toshack, who blooded these players very young, always said they would be a golden generation. Their spirit is excellent. They haven't got the best individual players to ever play for Wales, but as a group, with their spirit, this is by far the best groupof players Wales have ever had. Around 20 minutes to kick-off in Nicosia where Belgium have to defeat Cyprus - or Wales qualify for Euro 2016. It's another strong Belgium line-up on show with Marouane Fellaini, Kevin De Bruyne, Vincent Kompany, Christian Benteke and Eden Hazard among the starters. He might not have been able to get the decisive goal this afternoon, but Gareth Bale does have something to smile about. You've voted him Wales' greatest player, ahead of Ryan Giggs in second and John Charles in third. Had we scored early, it would have settled us down. The atmosphere was great but we have two games left. It is in our hands so Israel and Belgium have to do their work to catch us." "What is the point in the extra officials? I've never seen them make a proper decision. They're just a waste of time; a waste of money. "That is three yards away. It is criminal. It might have been difficult for the referee because of the angle he's at. But the other official is in the perfect position." Wales midfielder Aaron Ramsey, speaking to Sky Sports: "We will take a lot of positives from the result. It just didn't quite come off in front of goal. "Ultimately we did alright because we had a long journey over to Cyprus and a few of the boy were struggling. "We are still top of the group. We'd have taken that at the start of the week." Wales captain Ashley Williams, speaking to Sky Sports: "They made it difficult for us, we wanted a win but it is another point and another clean sheet. "We wanted to get it done and dusted today but is has been a positive week with four points. "We have two more games to go, we are still top of the group and we keep the momentum going." It's all over in Turkey, where Netherlands have suffered their heaviest competitive defeat since 1996. Can you remember that 4-1 loss against England? Alan Shearer wheeling away in celebration? Elsewhere, Czech Republic have beaten Latvia 2-1, meaning the Dutch can only qualify if they can somehow finish third. They have to hope Turkey drop points from their last two games now. A summer tournament without the Dutch? That's the way it's shaping up. I don't think we should be disappointed at all. Wales gave absolutely everything they had to a man. They've been terrific. They should have won today's game but a totally incompetent official gets a big decision wrong. He's bottled it. My five year-old daughter Stephanie would have done better than him today. But I believe we are on our way to France. I think it's a fantastic decision. Great decision from the linesman. That's the one they got right. Church could have been the hero, but it's not to be. Postpone the party. 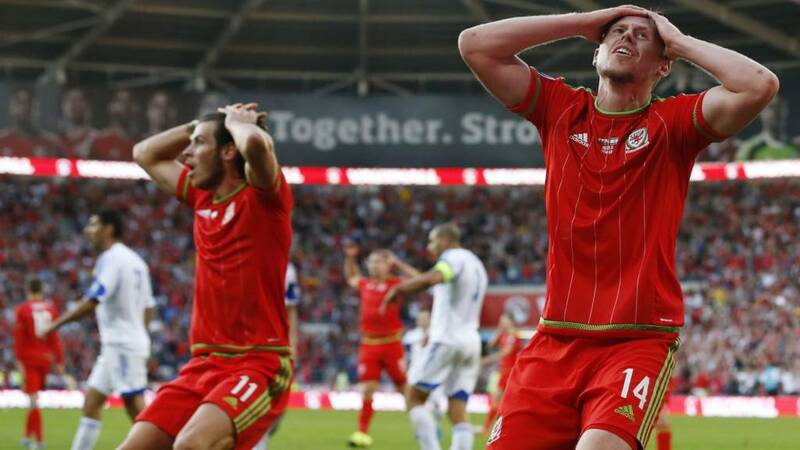 Frustration for Wales but they will qualify for Euro 2016 if Belgium fail to beat Cyprus. Simon Church has the ball in the back of the Israel net after Gareth Bale's header. Fans are going wild but the celebrations are ended by an offside flag. Aaron Ramsey lines up a shot and lets fly...but it's not good enough to beat the keeper. It is game over for Netherlands. There are five added minutes but it won't be enough. Burak Yilmaz has added a third late on for Turkey. Israel have one aim only..to run down the clock. They're succeeding. The Cardiff City Stadium is a sea of frustration right now. Four minutes of additional time. Wales fans find their voice again. Is this going to end in frustration? Inside the last minute. Eitan Tibi produces a fine challenge to deny Sam Vokes from close range. Israel have been stubborn at the back but here's an opening. Gareth Bale is trying to create some magic and very nearly does. His low shot from 20 yards is parried by the keeper and the ball squirms across the six yard area...before being hacked clear. "This is very positive from Chris Coleman. That's the second striker he's brought on now. He clearly wants to win the game, he wants to take Wales to France and get the job done. He has five minutes to do it." Gareth Bale lashes another attempt wide before Sam Vokes comes on for Andy King. Not long left now. Defeat to Turkey will leave the Netherlands' hopes of qualifying for the European Championship in France next summer in serious jeopardy. If the score remains the same, the Dutch will have to rely on Turkey dropping points in their last two games if they are to head back up to third. Whoever finishes behind Group A's likely top two of Iceland and Czech Republic will be guaranteed a place in a two-legged play-off against another of the third-placed sides. But that's not looking like being the Netherlands. They're running out of ideas, and frustration is growing. Israel have hardly caused the Wales defence any problems but suddenly they're on the counter. In comes a cross and Tomer Hemed heads towards the net forcing Wayne Hennessey to tip over. "I'm surprised by that substitution. Why not put Sam Vokes on? There will be more and more long balls played up and you need someone to profit from them." Israel are running down the clock.Can Wales come up with another late winner like they did in Cyprus? "He's gone like for like with this substitution. He's quick, he's lively, but I would not have taken Hal Robson-Kanu off personally." Simon Church comes on for Hal Robson-Kanu, who has run himself into the ground. Israel are packing their defence. Even Gareth Bale cannot find the right combination to unlock it. Hal Robson-Kanu has been everywhere. He's caused pandemonium in the Israel defence and he's just sent Omri Ben Harush flying with a wholehearted challenge. He wants to spend next summer in France but will he get there?. Fifteen minutes left. It's one of the most familiar sights in international football - the scores ofNetherlands fans clad in synchronised orange, crammed into a stadium halfway around the world. But as things stand they are looking increasingly unlikely to make the short journey to France for next summer's European Championship. Turkeyare bossing this one. The Dutch are pouring forward in search of the two goals they need to hold on to third but it's their hosts who've come closest to scoring, on the break. Cardiff City Stadium is bouncing again. The fans are trying to lift their players. They have been magnificent all afternoon. One thing is for sure, they're going to add to the fun of Euro 2016 if/when Wales get there. Can Wales dig deep and find a goal? What is the fifth official doing there? He is two or three yards away from the incident - that's what's frustrating about this. He can't even make a simple decision from three yards away. "Unbelievable! Robson-Kanu made a great run and the defender just stuck his arm out. It's a definite penalty!" Hal Robson-Kanu wants a penalty after Gareth Bale's inswining ball strikes Eitan Tibi on the arm. The referee is not interested. Moments later Ben Davies goes close with a header. No sign of a change yet on the Wales bench. They left it late in Cyprus on Thursday. Are they going to find another late winner? "Andy King got away from his marker, it’s a free header and he’s put it straight at the diving keeper. "It might be time to introduce Sam Vokes soon." A corner by Aaron Ramsey falls to Andy King who powers a header towards the net but the Israel keeper is equal to it. The noise levels increase. Wales are banging on the door. Another yellow card for Israel, this time Nir Bitton is booked for a foul on Hal Robson-Kanu. "Gareth Bale's got to go for power, surely? It’s a hard skill to get it up and over the wall like that. If he goes for power, it could deflect, there could be a rebound… He’s rubbish!" Half an hour for Wales to find a goal. Or the party is in danger of falling flat. Is there any sign of a Netherlands comeback against Turkey? Memphis Depay really is sparkling down the left wing, he put in a pinpoint cross for Georginio Wijnaldum - usually so good in the air - but the Newcastle man fluffed his lines. In the end the ball dribbled wide off Wijnaldum's shoulder and neck, but Turkey are steeling themselves in expectation of an inevitable second-half onslaught. It's no secret the Dutch need to score. They need to do it twice if they want to hang on to third in the group and a place in the play-offs. Here comes Gareth Bale 20 yards out...and it dips just over. Wales fans have heads in hands. Hal Robson-Kanu is sent sprawling by Orel Dgani but the referee awards a free-kick. "Wales have got to keep probing. There’s no need to panic or do anything rash. Patience is the key – we will get an opportunity to score again in the second half." Nice passage of play by the hosts. Aaron Ramsey sends Gareth Bale clear but the Real Madrid man has work to do. He leaves one player behind, takes one look up, before letting fly. Wales' 10th shot of the game is high and wide. A delicious cross by Jazz Richards finds Hal Robson-Kanu lurking on the edge of the six-yard area but he can't keep his header down. Israel are playing keep-ball. There's a lot more intent about them and they are making Wales work hard to win back possession. Change of tactics for Israel and they have already caused the home defence more problems in these opening few minutes of the half than most of the first 45. "Wales need a little bit more space between their back line and their goalkeeper. If there is that big a gap, then I think Wales can get players in, especially Gareth Bale running at defenders. "But at the moment, they are defending on the edge of their 18-yard box, there is no space in behind and it’s quite difficult for the lads to break down. "So they’ve got to be patient – don’t put the ball in the box for the sake of putting the ball in the box. A draw will do." "I’d like to see Gareth Bale get on the ball a bit more. He didn’t play well in Cyprus but he ended up scoring the goal. We want to see him get the ball in the final third and try to get that goal for Wales." Half-time in Konya and the Netherlands really have it all to do. They trail Turkey by two goals to nil, and their hopes of qualifying for Euro 2016 are fading. Since the hosts doubled their lead through Barcelona's Arda Turan, Robin van Persie has come closest for the Dutch. But as it stands the unthinkable is beginning to seem like the only outcome. Turkey have jumped them with two early goals, and it's not looking like there's a way back. Eli Dasa is about to take a throw-in for Israel. But he's playing for time and delays it. The referee marches over and shows the Israel player a yellow card much to the delight of the home fans. In it comes...and comes to nothing. Sums up Wales in the last 20 minutes. Neil Taylor wins a corner. A huge roar goes up. The key word from John Hartson is patience. Wales are going to have to work for victory but chances will fall their way. Gareth Bale has dipped in and out of this but he will know there's plenty of time for Wales to score. "Patience is going to be a key focus for Wales. Israel have just started to get a bit of possession and Wales have been a bit sloppy at times, giving the ball away too easily." What does Chris Coleman say to his players at half-time? Same again? Remember Wales can qualify with a point - as long as Belgium fail to defeat Cyprus later. Cheers as Israel are forced to pass back to their keeper who kicks the ball straight out of play. No doubt about it. The visitors have come back into this but Wayne Hennessey still has yet to make a save. First murmurs of frustration from the stands as Aaron Ramsey's free-kick rolls harmlessly out of play. It's gone a little bit flat. Israel are inviting pressure. They have five players strung across the back with a further two just in front. They are here for a point and with half an hour gone it's going to plan. But they are playing a dangerous game. It goes from bad to worse, for the Netherlands. Memphis Depay had his marker on toast down the left wing and his lovely weighted ball into Robin van Persie gave an intriguing taste of what their combination might have been like at Manchester United. Van Persie layed it ball off to Wesley Sneijder but the Galatasaray man could only fire straight at the 'keeper. And then moments later Arda Turan fires in at the near post to double Turkey's lead. It was really suspect goalkeeping from Jesper Cillessen, but a fair portion of the blame has to go to Daley Blind for his defending. There's trumpets, drums, heck, there's a full band inside the ground. And they are sure making themselves heard. This is a special atmosphere. Play is held up as Tal Ben Haim receives treatment after an accidental clash with team-mate Nir Bitton while attempting a headed clearance. The pace of the game has slowed dramatically. It's hardly surprising considering the way Wales started. They're patiently building from the back. Israel's defenders are huffing and puffing and coming under constant bombardment. "I can't believe Israel have not got a man marking Bale. He's got a free role and he is getting into spaces which are allowing him to really influence the game." Spine-tingling stuff as Men of Harlech rings round the ground. Terrific support for Wales. Twenty minutes gone and Wales have enjoyed 65% possession. Not only are they dominating but they're also winning all the battles. The stat that counts, however, is still 0-0. It's been helter-skelter 100mph stuff. The fear is that Wales will eventually run out of steam but they are being driven forward by a boistrous home support. Wales legends are out in force. Ian Rush is smiling and so he should be. There has been wave after wave of Wales attacks. The only disappointment is they haven't scored. Hal Robson-Kanu heads another chance wide before Gareth Bale's attempt is deflected behind for another corner. The Netherlands began the day with a serious question mark around their chances of making it to Euro 2016. The Dutch are third in Group A, six points behind the Czech Republic and another two off group leaders Iceland. Their game away to Turkey is effectively a play-off for third, and it has not started well - Oguzhan Ozyakup has put the home side ahead already. Are we going to have a European Championship without all that orange? Aaron Ramsey knows he should have scored but undeterred he is back snapping at the heels of Israel's under-pressure defenders. The visitors just cannot get out of their half. "What a first 10 minutes from Wales - they have been totally dominant. The only concern would be that you have to score when you're so much on top." Wales should be celebrating but instead groans ring out as Aaron Ramsey heads over from close range after Andy King's shot had been blocked by Ofir Martziano. Great play by Jazz Richards down the right in the build-up to that move. Make no mistake, Chris Coleman's men want the job done today. They have set off like an express train. Lots of short, sharp passing. Another promising move ends with a careless pass by Neil Taylor. This time Hal Robson-Kanu takes aim...and fires wide. Wales full of purpose, desire and energy. Carnival atmosphere inside the ground. No sign of any early nerves from the men in red. Gareth Bale and Aaron Ramsey have seen plenty of the ball. Israel can't get out of their own half. Wales come flying out of the traps. Aaron Ramsey with a spectacular long-range effort followed moments later by a snap shot from inside the area by the Arsenal player. This is just what Chris Coleman ordered. "I've only got one line for these Wales players: Go out there and do it for Gary Speed." Wow. If that doesn't inspire Wales nothing will. Truly powerful. Hairs on the back of your neck and all that. Brilliant. Here's singer-actress Sophie Evans with Land Of My Fathers. I'm not sure the Cardiff City Stadium has witnessed an atmosphere like this. The place is bouncing. It's a sea of red. The pocket of Israel fans are being drowned out by a raucous home support. Wales manager Chris Coleman, speaking to Sky Sports: "We can sense the excitement but we are in a good way. It will be a tough game, a big challenge but we are ready. "It is difficult because you know what is going on and what is possible. When you start thinking too far into the future, that is when you have problems. Israel is our challenge today. "We were tired against Belgium but the fans got us over the line. The players sensed the passion and I have seen nothing like it. They will need to be patient but we will need them again. "We are in a good position, a great opportunity for us but we have not done anything yet." "The Welsh public will be proud to have Giggs and Bale as their best players. But Bale is - for me - the greatest player Wales have had." One of the biggest things the Wales players will have to deal with today is holding their emotions together. There's a lot of excitement and there will be a few tears if they get over the line. I expect Wales to win. But if they don't get it done today then they still have that cushion." Fifteen minutes to kick-off. Who's getting excited? Blue skies above the Cardiff City Stadium and the fans are streaming in. "Wales, Wales, Wales," roar those already inside the ground. Gareth Bale is given a standing ovation as he leaves the pitch and heads for the dressing room. BBC Sport's Dafydd Pritchard at Cardiff City Stadium: "The atmosphere is simmering inside the stadium as they players warm up. "One fan tells me he has placed a bet on Wales scoring in the 58th minute, in reference to Wales’ last appearance at a major tournament, the 1958 World Cup. "The bookmaker in question has apparently taken more than a dozen of the same bets today. "It seems Wales’ fans are a superstitious bunch, and confident of their chances against Israel." Spare a thought for the stewards on duty inside the Cardiff City Stadium if Wales win. Fans have been warned not to ruin what could be football’s biggest day in the principality for more than half a century by trying to get on to the pitch to celebrate. The shadow of what happened in Andorra 12 months ago hangs over the national team when Gareth Bale’s late winner in the Pyrenees was greeted by a pitch invasion of jubilant fans. The Football Association of Wales (FAW) were fined £3,950 and warned by Uefa over the future behaviour of their supporters. A massive game in Group A sees Turkey host the Netherlands, with the Dutch struggling to qualify for Euro 2016. A win for the Turks will see them leapfrog their opponents into third place in the standings. Leaders Iceland face Kazakhstan (19:45 BST) and Czech Republic are in Latvia. In Group H, Croatia and Italy are locked on 15 points, separated only by goal difference. The Croats have a difficult away match in Norway, while the Italians are at home to Bulgaria. Chris Coleman has proved to be an expert at rallying his players but if the Wales boss was looking for a different voice to inspire the team he could do worse than invite John Hartson into the dressing room. "I failed and Ryan Giggs,Craig Bellamy and Robbie Savage - we all failed, Mark Hughes, Ian Rush," former Wales international Hartson told BBC Radio 5 live before Thursday's win in Cyprus. "Do you think they're going to mess it up now? Absolutely no chance. Wales fans - book your trains, book your flights. We're off to France." Listen to Hartson's full speech on the BBC Radio 5 live website. What a welcome for Chris Coleman's team outside the Cardiff City Stadium. Just over 40 minutes to the start of the biggest match in a generation for Wales. It will be red hot inside the Cardiff City Stadium at kick-off but Wales boss Chris Coleman will still be wearing his lucky black jacket. The 45-year-old has revealed he has not even sent the blazer to the dry cleaners throughout the entire qualifying campaign as a result of his side's unbeaten run. "I'm not sure people will be too happy standing too close to me but the jacket will be on, don't worry about that," he tells Wales Online. It's a massive game for the nation and to be in this situation and having a chance to qualify... as a player you cannot wait to get going. I'm sure last night the players didn't get much sleep thinking about the game and knowing one more good performance will get them over the line." Is Gareth Bale Wales' greatest ever player? Former Wales internationals Robbie Savage and John Hartson will take you through the game on BBC Radio 5 live. There is full match commentary from Ian Brown from 17:00 BST. BBC Sport's Dafydd Pritchard at Cardiff City Stadium: "Wales have been on the brink before, but it feels different today. "Absent from major tournaments since the 1958 World Cup, Wales have fallen short on numerous occasions, narrowly failing to qualify for the 1994 World Cup and Euro 2004 among others. "But Chris Coleman’s side could banish half a century of heartache if they beat Israel today and qualify for Euro 2016. "The Cardiff City Stadium sold out long ago and, bathed in glorious sunshine, Wales’ capital city is buzzing as thousands of fans dare to dream of next year’s tournament in France. "Supporters are nervous but the vast majority are confident too. They feel this is Wales’ time." Wales XI: Hennessey, Richards, Gunter, Williams, Davies, Taylor, Edwards, King, Ramsey, Bale, Robson-Kanu. Israel XI: Marciano, Ben Haim I, Dasa, Dgani, Ben Harush, Tibi, Bitton, Natcho, Zahavi, Kayal, Dabbur. Gareth Bale has helped carry this Wales side to the top of Group B and towards Euro 2016 in France, so is the Real Madrid forward now the country's greatest ever player? How does he rank alongside legends such as Ian Rush, John Charles and Ryan Giggs? Tweet #bbcfootball, text 81111 (UK only) or post a comment on the BBC Sport Facebook page. Right, so what are the permutations for Wales this afternoon? Win and they qualify, we know that, but if they fail to win they could still be celebrating later today after Belgium meet Cyprus in Nicosia at 19:45 BST. We've had our calculators out, crunched the numbers and we've come up with the following. Wales are on the brink of making history, but who is their greatest ever player? You can vote for one of eight players. Quote Message: Cast away the calculators, Gareth Bale has simplified the maths required for Wales to reach the Euro 2016 finals. After the 1-0 victory over Cyprus in Nicosia Chris Coleman's men have three games left to guarantee themselves a place at the finals of a major tournament for the first time since 1958. But a nation wants to party this weekend. And a win against Israel would seal the deal and fire the starting gun for a celebration in the streets of the capital . . . and the rest of the country." Cast away the calculators, Gareth Bale has simplified the maths required for Wales to reach the Euro 2016 finals. After the 1-0 victory over Cyprus in Nicosia Chris Coleman's men have three games left to guarantee themselves a place at the finals of a major tournament for the first time since 1958. But a nation wants to party this weekend. And a win against Israel would seal the deal and fire the starting gun for a celebration in the streets of the capital . . . and the rest of the country." According to the Visit Cardiff website, the capital of Wales is rich in romantic ambience. But anyone who has booked a quiet getaway with their other half in the city tonight should beware. Cardiff knows how to celebrate. And if Wales reach Euro 2016, expect the party of all parties. So near yet so far... Wales fans have heard it all before. In the 1982 and 1986 World Cup qualifying campaigns they missed out on goal difference, and a missed penalty in the final match cost them a place in the 1994 tournament. Then there was a play-off defeat against Russia for Euro 2004. But this is different. Wales have a three-point cushion at the top of Group B with three games remaining. They still have whipping boys Andorra to play at home. But Cardiff is ready to party today. Can Chris Coleman's Class of 2015 oblige? Their story is punctured with near misses and inglorious failures. They have raised the expectations of a proud nation only to fall at the last hurdle. There has been heartache, tears...and humiliation. But Wales are a team on the rise, one win away from a first major tournament appearance since 1958 with games to spare. A nation holds its breath. Surely this is their time? Surely they won't blow it now?